Samplers & Needle Arts many other Hearts-Desires categories.....Complete site map is to the left. Needle art is a broad, broad area to consider....sewing, lacemaking and more....using (you guessed it) needle and thread. All needle art is needlework; not all needlework is needle art. If you hem up a skirt or darn a sock, you are performing necessary needlework. Needle art implies that the work is to be seen and appreciated; artistic in design or execution. In byegone days, almost every housewife (and her maiden aunt) was an artist with her needle. Few of us today have the time or skills that were so prevalent way-back-when. But we share the desire to decorate our homes with warmth and charm. 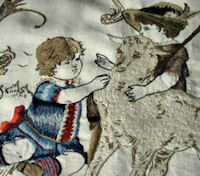 Vintage needle arts give us the opportunity to do so, investing only a fraction of the time and expertise. You can choose from a variety of needle art pieces, use one or a combination; and create your own one-of-a-kind look for your home. Needle arts fall into two main, and several minor categories. 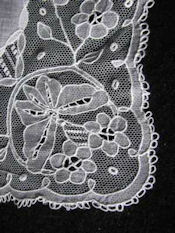 Lace: The Most Popular of Needle Arts. Lace is a broad category in itself. Holes combine with threads or fabric to create patterns. 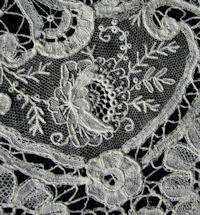 All lace may be considered needle art as it fulfills the definition of being created as a decoration. 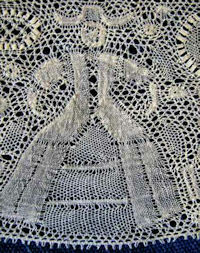 There are seemingly endless types of lace. In one category, such as crochet lace, we have Irish crochet, Vietnamese crochet, filet crochet, figural filet crochet, and so on, and so on. In addition to overlappings within the category, many laces were named for the area in which they were "invented"; and who's to say that several far-apart lacemakers could not have come up with the same technique, each claiming it unique to her own region? 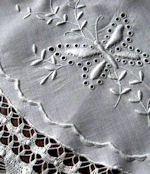 It isn't necessary to identify lace by name or region; if it's beautiful, it's needle art. If you like it, use it. Many of the most gorgeous pieces are combinations. The skilled lacemaker learned every technique she could and used whatever and wherever her art inclined; she created needle art every time. 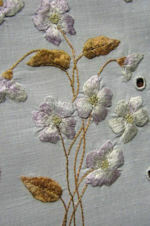 Embroidery is a decoration added to the original piece; stitching on top of net, lace or fabric. 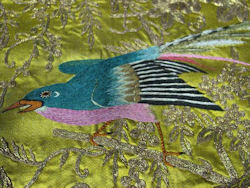 Although embroidery is identified by the stitch, most pieces display a variety of stitches in artistic combination. Embroidery flosses (threads) come in every color of the rainbow. Some flosses were dyed in shadings, such as pearl-pink to pink to rose to deep-rose or red, white and blue. One or several strands may be carried in the needle to achieve varied textures. These same flosses were frequently used in lace edgings. 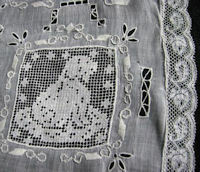 Whitework, sometimes referred to as white-on-white, is usually considered the finest needle art embroidery.  Obviously, it consists of white floss used on a white background. It depends entirely on the expertise of the needlewoman for its artistic value. 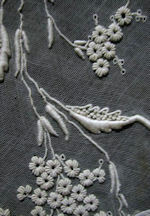 The pleasing design is created by the variety of stitches, often with padding and/or knots adding three-dimensional effects. One very specific form of embroidery does have a name. 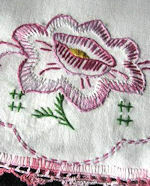 Society silk refers to a needle art practiced by "society" women. Glowing silk flosses, almost always one to a needle, were used on off-white linen. 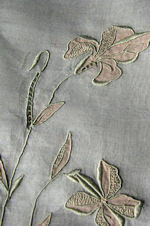 Pre-printed art nouveau designs were satin-stitched and half-stitched into beautifully shaded flowers. Another is called redwork, in which charming figural designs are worked in red floss, outline stitch onto a white background. In redwork, the art is more in the design than the skill of the needlewoman. 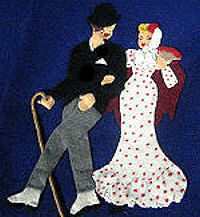 A less frequently used, but no less effective, needle art technique is applique. Pieces of fabric are cut into design parts and sewn onto the background fabric or net. Embroidery usually adds the finishing touches. tiny part of the piece! Pieces of needle art should contain one or more of the above elements. Mix-and-match of laces and embroideries seems to create the most desireable pieces. As you consider various needle arts, you will form your own preferences. 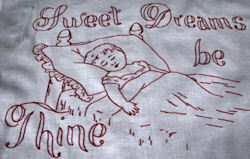 Whatever your choices, vintage needle arts will enhance every room in your home. The needle arts described above are just a few of those displayed at Hearts-Desires. Photos show a few that are available at the time of writing. The site map to the left shows you these and others that you will wish to view while familiarizing yourself with vintage needle arts.